Google launched an online Digital Training, proposed to train as many staff and students in africa as possible. I am currently doing my own online in my office. 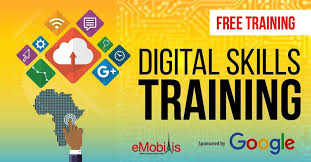 It has not been easy for me but i guess its will be very good if you know about Digital training. The best part of it is that you can add it to your CV too to boost your curriculum vitae. Learn the digital marketing tools available to grow business, etc. Encourage entrepreneurship among young people. Teach them how to attract the attention of potential employers or markets and convince them that they are the ones they should employ or do business with. Requirement for Digital Training online. For registration you need a google account. You will have to answer some questions before the real lesson starts. You will need an internet service to be online. Internet service to stream the video or if you dont have data, read the transcript. The lesson has so many stages and you must pass all sections.